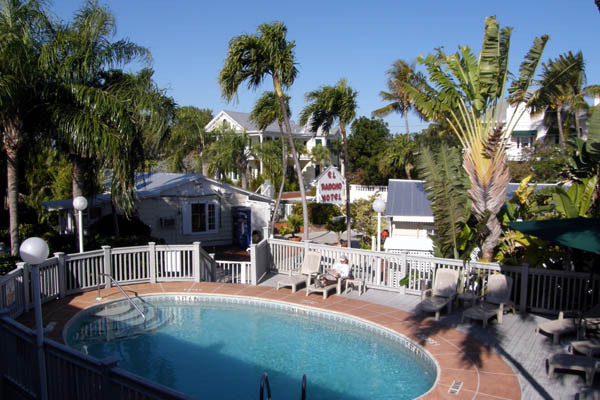 El Rancho Motel is centrally located in Old Town Key West, just 2 blocks away from Duval Street, and only 5 blocks away from the beaches and Marinas. Our guests have the convenience of walking or biking to the rest of the best parts of this beautiful island. Enjoy a quiet afternoon around our pool, surrounded by palm trees or relax in our lush tropical garden patio. After you settle in, you will be ready to explore our beautiful island with its tropical weather and lush vegetation. A few blocks from the hotel you will find interesting attractions including: the Hemingway House, Lighthouse Museum, Southernmost Point, and Mile Marker 0. These are only a few of the interesting things you will see in our unique and historical city. Key West's near perfect tropical climate lets you participate in a variety of water sports nearly every day of the year. There is something for everyone - shopping, tanning, snorkeling, sailing, fishing and biking around the island. The El Rancho Motel has 50 newly refurnished rooms with most rooms facing our lush tropical garden courtyard. The courtyard amenities include a heated pool, sundeck and tiki huts. We sincerely wish to invite you to our friendly, affordable and conveniently located hotel. Start your day in the courtyard garden with complimentary coffee. We are here 24 hours a day to serve you, helping you plan your itineraries and recommending places for dinner, bike rentals, mopeds and much more.